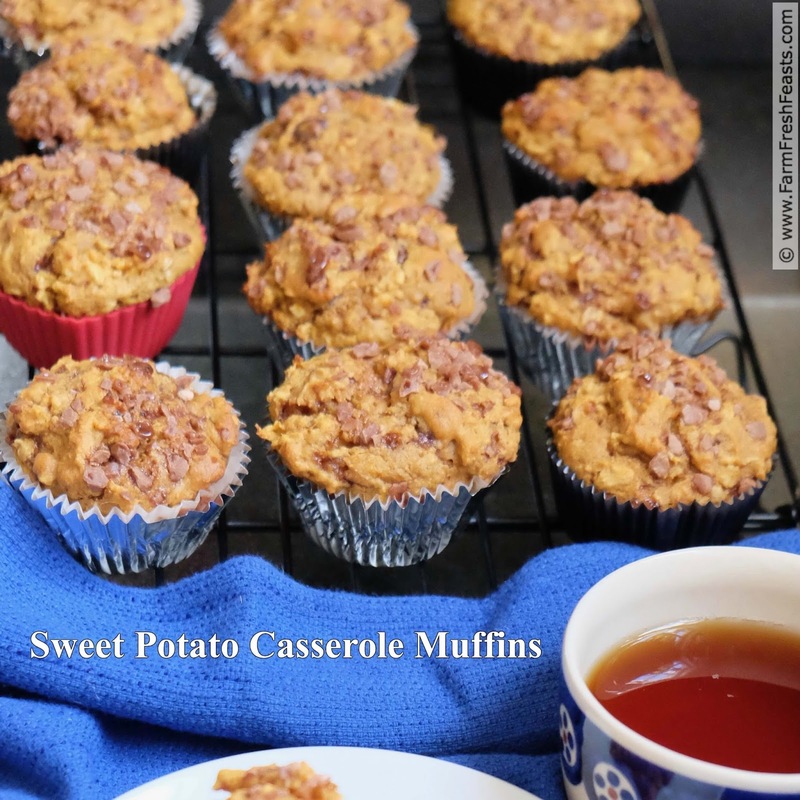 Sweet Potato Casserole muffins combine roasted sweet potatoes and cinnamon chips in a wholesome whole grain treat. 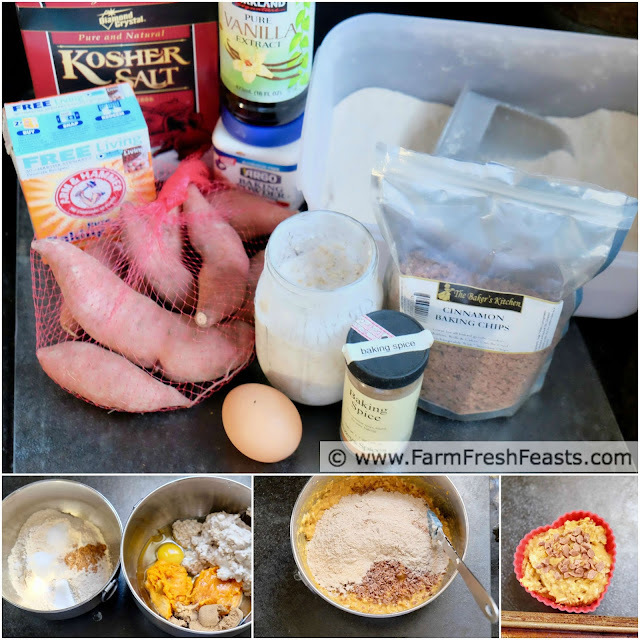 These muffins would be terrific for a holiday breakfast or a quick sweet bread alongside a holiday dinner--plan ahead and bake an extra sweet potato to make them! I like to make festive muffins using the seasonal ingredients from my Community Supported Agriculture (CSA) farm share. 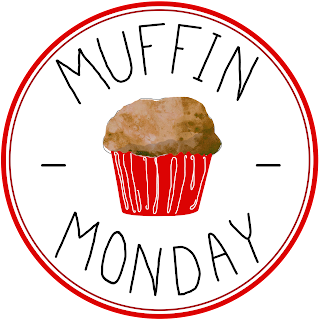 One of the reasons I enjoy participating in Muffin Monday is the creative stretch to come up with something new each month. When I made these muffins last winter, I carefully hoarded the recipe in my Mobile Office until sweet potato season returned. Now that my farmers' sweet potato crop has been dug and is curing, I'm glad to share these muffins with the Muffin Monday crowd. These muffins have cinnamon chips in and on them. I got mine at Jungle Jim's, a massive store known around the midwest for having just about anything from anywhere. You can get your cinnamon chips online, if you can't find any locally. I've included an Amazon affiliate link below to help your search. The base of these muffins is my amazingly adaptable Up to Overnight Soaked Oat muffin batter recipe. When I have buttermilk on hand, I can't help but throw a cup into a wide mouth pint canning jar and add oats. These days I'm likely to use steel cut oats since my spouse gifted me with a near-Costco size bag of them, so if you've got steel cut oats go right ahead and use them. I know they work fine--although I've only left steel cut oats to soak overnight, not just an hour. For more recipes using sweet potatoes, please see my Sweet Potato Recipes Collection. It's part of the Visual Recipe Index by Ingredient, a resource for folks like me eating from the farm share, the farmer's market, the garden, the neighbor's garden, and great deals on ugly produce at the grocery store. Note: this recipe calls for soaking oats in buttermilk for at least an hour. It's super easy to combine the oats and buttermilk the night before, or even several days before, and store in the fridge. If you like pecans in your sweet potato casserole, toss in ½ cup of chopped pecans when you add the cinnamon chips. Combine oats and buttermilk in a bowl. Let sit for 1 hour. You can do this several days ahead and store in fridge. When you're ready to bake, preheat oven to 400 degrees Fahrenheit and line a 12 well muffin tin with paper liners. Spray with oil spray for easy releasing after baking. Dump sweet potatoes, oil, vanilla, egg and sugar into the bowl with the oat mixture. Stir well. In another bowl, whisk together flour, baking powder & soda, and spices. Dump onto wet mixture, stir briefly, add cinnamon chips and mix until just combined. Scoop into prepared muffin pan, filling ⅔ of the way full. Sprinkle additional cinnamon chips on top as shown. Bake for 18 minutes until tops are lightly brown. Cinnamon chips may not be fully melted. Cool in muffin pan for 5 minutes, then transfer to a wire rack. I love the versatility of your soaked oatmeal batter, Kirsten! 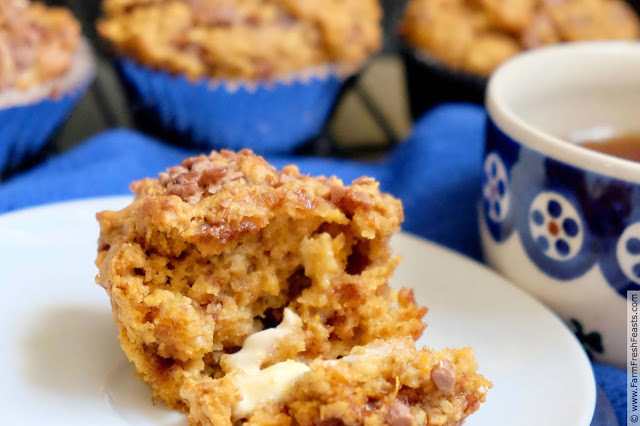 Cinnamon and sweet potatoes are a muffin match made in autumn heaven! I am going to try that soaked batter with steel cut oats. Thanks for sharing Kirsten. I just happen to have some cinnamon chips hanging around waiting for this recipe. These sound amazing! Is that a heart-shaped baking cup? 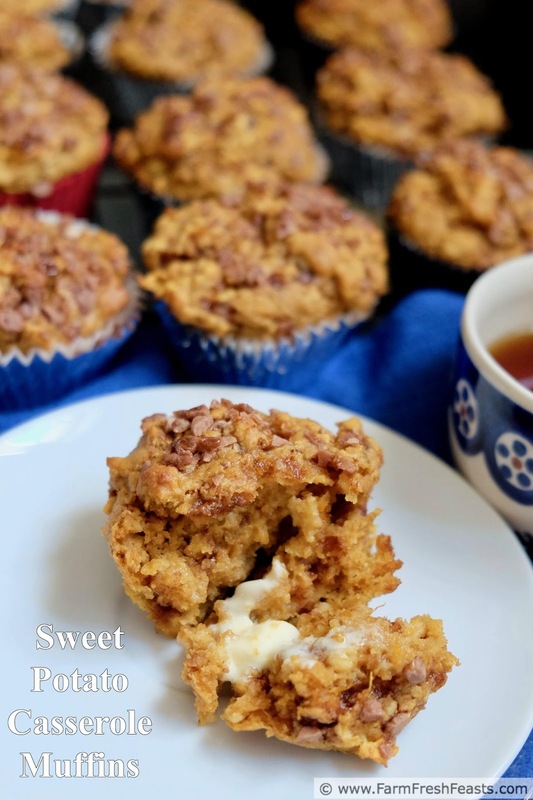 I love the addition of cinnamon chips and you already know how I feel about your buttermilk soaked oat muffins. These are a winner. These are brilliant and would be so perfect on a Thanksgiving table! !